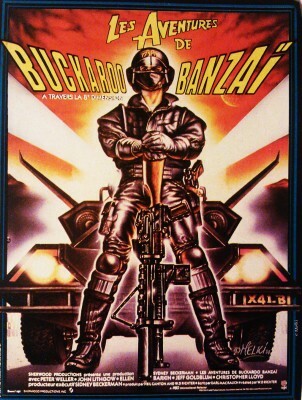 All at once a rock star, a neurosurgeon, a martial arts and particle physics expert, Buckaroo Banzaï sets off to fight creatures from another dimension. Behind this improbable movie hides a sort of huge acid candy fed on pulp culture, whose catastrophical release rang the knell for Sherwood Studios. The director, W.D. Richter, a gifted scriptwriter, (Invasion of the Bodysnatchers, Dracula, Needful Things) presents an iconic character played by Peter Weller (RoboCop, The Naked Feast), that reminds of Jack Burton and his adventures, directed by John Carpenter two years later, and written by... W. D. Richter. A wacky movie from the 80s that brings back the unbridled freedom of serials and pulps. A sort of Doc Savage who plays rock'n'roll, along with rastafari aliens... plus a flurry of actors I'd love to work with : Peter Weller, John Lithgow, Jeff Goldblum, Vincent Schiavell and Christopher Lloyd who plays John Bigbooty...What more could you ask for ?